You know, I am fascinated by the fact the Bible applies to every aspect of life, and its guidance always proves true! Yet, we often don’t take it seriously. We read the words but don’t actually live by them. Instead we live as though there’s a “just kidding” at the end of it all. I know that at times I have been, and sometimes am still guilty of this. Oh the fickleness of the flesh!! I think Psalm 1 is a key example of this. It provides some food for thought; therefore, I just have a few questions for your grey matter this week. 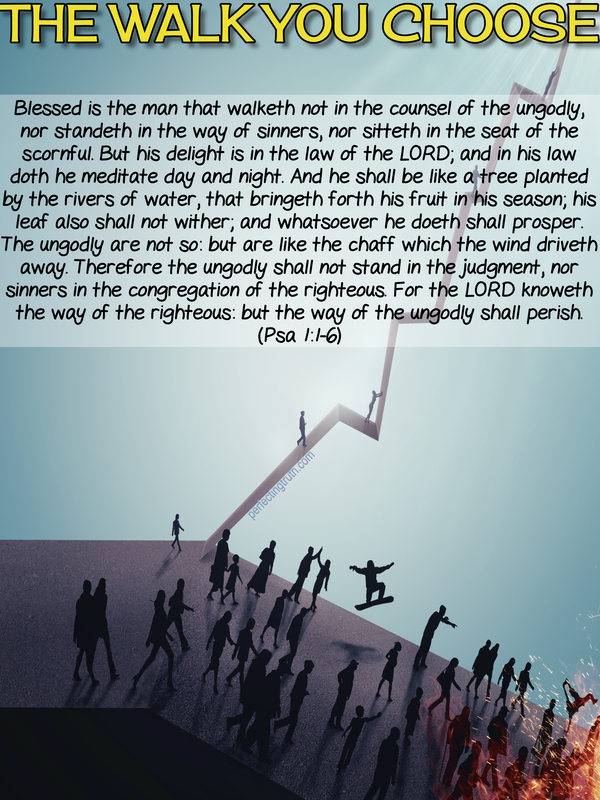 In what ways can we walk in the counsel of the ungodly? In what ways do you? In what ways can we stand in the way sinners and sit in the seat of the scornful? In what ways do you? How does one delight in the law (Word) of the Lord? Do you delight in the Word of God? Can we trust God to keep His Word? Do you? What path are you choosing to walk? Would God declare you ungodly or righteous? Thanks for taking time to read and comment on the post! I love the way you put that, “Instead we live as though there’s a “just kidding” at the end of it all.” That is so very true. I must say that I have been guilty of that myself, although I didn’t see it at the time. God is very serious, He is not joking with us at all. We have to remember all that Christ went through to make it possible for us to live for and with God. The price was too great for us to half-step our way into heaven. We have to truly be found so doing. Take the Word seriously and strive to please God in every area. I am happy to know you found the post beneficial. I bless the Lord. I’ve been guilty at some point too. Been telling myself this morning,if Jesus was able to live right ,His father’s will ,here on earth , then I can….because the same Spirit that was in Him lives in us. I always pray that I apply what I read to my daily life, but often times fall short. I would love to do a better job digging into the Word, and really understanding what it means and using it to impact others. Thank you for sharing! Thanks for reading and sharing your thoughts. God bless you! That is absolutely wonderful!! It is such a blessing to belong to The Only True and Living God; the One who wants a relationship with us and whose presence can be enjoyed! Some good food for thought! We can delight in the Word when we read it while asking the Holy Spirit to speak to us. When we start to make Jesus the focus of our days, then our hearts will transform. Delighting in the Lord is a subject that I don’t ever recall being discussed in church when I was growing…or after for that matter, but I believe it is important. We have to do our part in the transformation process; sometimes I think we forget that! When we do our part then, like you said, our hearts will transform. AMEN ! ! ! ! & AMEN!!! After we “try” the Word and find out how true it actually is… we will fall in love with The Word. Once we fall in love with The Word… we will be so delighted with it until we will definitely obey The Word every day! Our obedience to The Word every single day will be the proof of our delight. * * * * The problems that we see today, come from a lot of church folks who are trying to delight in The Word WHICH they have not tried yet!!! Many are preaching a word that they have not tried yet!!! Many are singing about a word that they have not tried yet!!! Many are testifying about a word that they have not tried yet!!! Many are praying about a word that they have not tried yet!!! Many are saying amen to a word that they have not tried yet!!! Many are dancing about a word that they have not tried yet!!! Many are shouting hallelujah about a word that they have not tried yet!!! Anyone who really comes into the truth of God’s Word ~ won’t have to try to delight themselves in it!! They will BE delighted in it . . . .
Hi Rodney. The more you learn the more you want to learn! Doing things because “that’s just what you do” is such an easy trap to fall into. We must guard against that by actually grabbing hold of God and His Word. Thanks for stopping by and sharing your thoughts. God bless you.